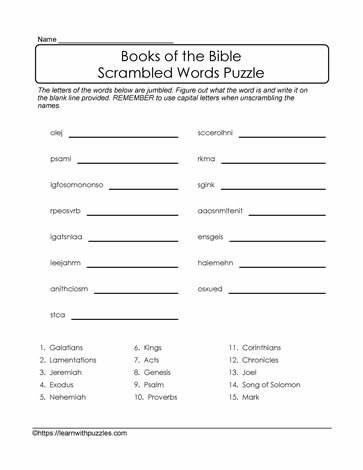 Jumbled letters Bible puzzle. Here are 15 more books of the Bible that need to be unscrambled. Suitable for students in late elementary grades 4,5,6, and homeschoolers. Use the list of bible words in the word bank to 'activate prior knowledge' about Bible books. Teachers could also us the word bank as a starting point for stories in the bible found in each book of the bible listed. Can be used in regular classroom and homsechooling environments, as well as in church Sunday schools. Engage vocabulary building and problem solving skills with this downloadable puzzle.